You expect first-class accounting, audit, and tax services from your Top 100 Accounting Firm, but our professionals are proving they are capable of so much more. Our technology consulting division has established itself as a leader in web development as well. Kemper Technology Consulting recently won a Gold ADDY® Award for its design of the Robinson Area Chamber of Commerce website, and a Silver ADDY® Award for the design of the Kemper CPA Group LLP website. Members of the web development team include Martin Roth, CPA and partner at Kemper Technology Consulting, Ashley Nixon, Matt Pearce, and Steve Ernstberger. The website development team was supported by the marketing efforts of Ronda Espenlaub and the copywriting skills of Tonia Johnson. Sponsored by the American Advertising Federation (AAF) of Greater Evansville, the ADDY® Awards recognize and showcase Evansville’s best advertising creative talent. 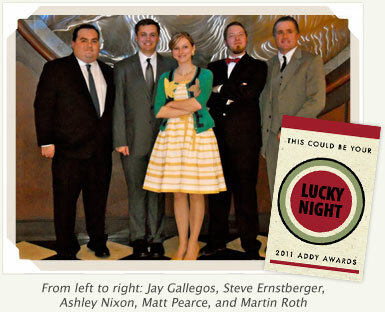 The ADDY® Awards are the advertising industry’s largest and most representative competition for creative excellence. The three-tier national ADDY® Awards Competition is conducted by the AAF annually. Copyright © 2011 Kemper Technology Consulting. All rights reserved.